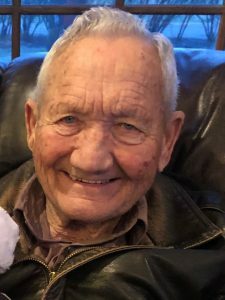 Thomas J. Topil, 83 of Rising City, died Tuesday, April 2, 2019 at the Butler County Health Care Center. Saturday, April 6, 2019 2:00 p.m.
Visitation Saturday, 10:00 a.m. to 2:00 p.m.
Thomas J. Topil was born September 17, 1935 in Butler county, Nebraska to Joseph and Lillian (Zavodny) Topil. He attended school in Rising City and graduated from Rising City High School. On December 20, 1958 Thomas was united in marriage to Jolene Shunk in Rising City. Thomas served in the United States Army from 1956 to 1958. He had worked for Behlen manufacturing for many years and later operated the grocery store in Rising City for several years. He also had worked for the Butler County Roads Department. He is survived by his daughter Patty (Kirk) Selden of Rising City and their children and grandchildren, Carrie (Brad) Carter of Rising City, Alexa, Rylie, Jaxon, Reese and Chase. Shane (Ryan) Pavlik of Rising City, Kira and Reid. Jaime Selden of David City and Jonah. Son Terry (Kristin) Topil of Rising City and their children and grandchildren, Jessica (Jake) Herrmann of Aurora and Brooks. Amber Topil (fiancé Nick Podliska) of Columbus, Hollynn and Emmitt Podliska. Ethan Soward of Columbus, Brandon Soward of Rising City. Son Todd (Becky) Topil of Lincoln and their children and grandchildren, Andy Kubik of Bryan, TX, Michelle Topil (fiancé Micheal Pringle) of Eudora, KS, Emmie and Macie. Danelle Topil (fiancé Kale Golden) of Milwaukee, WI, Broderick Topil of Evanston, IL. Brother Joe(Carol) Topil of David City and many nieces and nephews. Thomas was preceded in death by his parents, wife Jolene in 2006, brothers Steve, Gary, Harry, Rich and wife Laura Mae Topil.